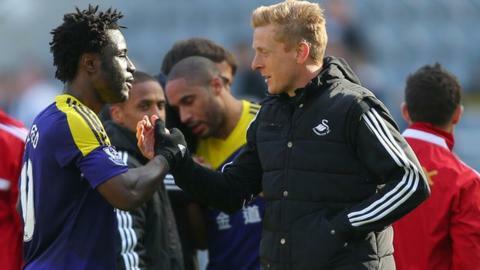 Swansea City head coach Garry Monk says striker Wilfried Bony "can only get better" after his match-winning efforts at Newcastle United. Bony's first-half header and late penalty brought a win that edged the Swans towards Premier League safety. Spanish striker Michu has missed large parts of the season because of ankle problems but Bony, 25, has shone during his first term at the Liberty Stadium. "He's been brilliant for us and he can only get better," said Monk. Shola Ameobi provided a stylish opener against the run of play for the Magpies and Monk later admitted Swansea have played better this season and lost. But Bony headed in from Ben Davies' corner to equalise and after substitute Marvin Emnes was brought down in the penalty area, the Ivory Coast international calmly hit the top right of the net from the penalty spot for an injury-time winner. That took Bony's recent tally to four goals in his last four away Premier League games. The victory took Swansea to 13th in the table, although they remain six points above the relegation zone with three games left, at home against Aston Villa and Southampton, followed by a final-day trip to Sunderland on Sunday, 11 May. Monk added: "He's been great, Bony. Obviously with Michu having an indifferent season with niggly injuries, Bony has stepped up to the plate and you can't complain at someone who gets 20-plus goals in a season in his first season here. "It's not just that, he's a massive character in our changing room. "He works so hard every day, he pushes everyone else. If he doesn't score, he's a strength, he's a presence up front and he can be a handful without scoring goals. "It's even better when he does add goals to it, so he deserves all the credit." "It was good. It was almost the end of the first half so it gave us confidence for the second half," he said.